Arrival in Moscow. Transfer to hotel. City tour, tour of the Kremlin and visit to the Christ the Savior Cathedral. 8h. 10.00 – 17.00 Visit to the Red Square, visit to the TretiakovArtGallery. 7 h.
9.00 – 19.00 Trip to Kolomna, incl. lunch (100 km from Moscow). 10 h.
(4 wheelchair accessible rooms available). 10.00 – 19.00 Trip to Kostroma. Kostroma city tour, visiting of the Open-air Museum of Wooden Art. Return to Jaroslavl. 9.00 – 20.00 Transfer to Vladimir, Vladimir city tour. Transfer to Moscow. Departure day. Transfer to airport. Prices of the packages depend very much on season, number of tourists, your choice of the hotel and can be available by request. 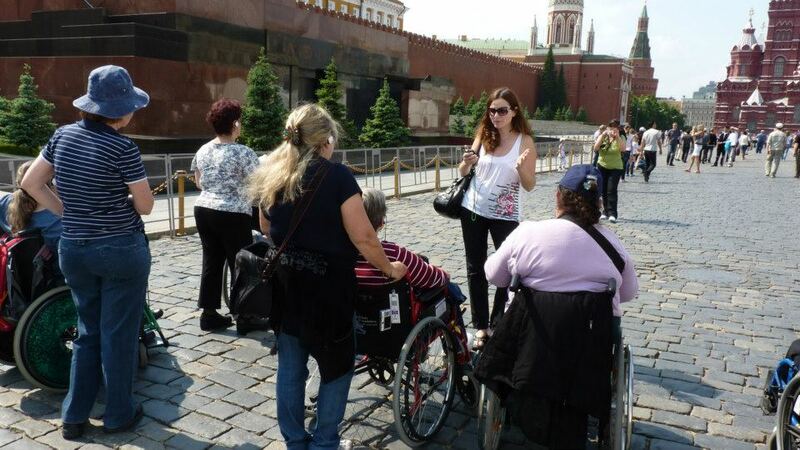 Price of a package covers a bus specially equipped for disabled travellers for all tours and transfers, guiding services, museum cover charges, accommodation in special hotel rooms for disabled travelers, (hotels **** or ***). Breakfasts and dinners in the hotel are included. Photo and video in museums are not included and are paid separately on the spot depending on the customers desire. Optional tours, visits to religious services, ballets, concerts, folk shows can be organized upon request. Excursion days may vary depending on museum hours and weather.